Thousands attended Sunday evening’s interfaith vigil for the shooting victims at the Soldiers and Sailors Memorial near the Tree of Life synagogue, Oct. 28, 2018. 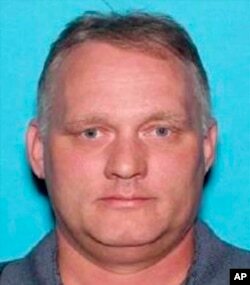 Robert Bowers, the 46-year-old truck driver accused of shooting to death 11 Jews at a Pittsburgh synagogue, made his first court appearance Monday. Bowers was brought before a U.S. magistrate judge in a wheelchair, hours after he was released from a Pittsburgh hospital. Bowers underwent surgery after police shot and arrested him in the Tree of Life synagogue Saturday morning. The magistrate ordered Bowers to be held without bail and scheduled another hearing for Thursday, when U.S. Attorney Scott Brady said prosecutors would begin to present their preliminary evidence against Bowers. Brady said the case would be handed to a grand jury within 30 days for a possible indictment. He said prosecutors are "working to make sure justice is done." This undated Pennsylvania Department of Transportation photo shows Robert Bowers, the suspect in the deadly shooting at the Tree of Life Synagogue in Pittsburgh, Oct. 27, 2018. Authorities accuse Bowers of carrying out the rampage out of vitriolic hatred of Jews, posting anti-Semitic tirades online and screaming "All Jews must die" as he opened fire. President Donald Trump and first lady Melania Trump will visit Pittsburgh Tuesday to express their condolences over the attack. Some Jewish leaders in Pittsburgh had already said they did not want Trump to visit unless he denounces white nationalism. But Trump spokeswoman Sarah Sanders dismissed their concern. She said the president has often denounced all forms of bigotry. The Anti-Defamation League, which has tracked hatred and violence against Jews since the 1970s, said the massacre was the worst attack against the Jewish community in U.S. history. Thousands of people gathered Sunday in Pittsburgh for a memorial service where religious and civic leaders came together with a message of resiliency, tolerance and unity. Rabbis were joined by leaders from other faiths at the University of Pittsburgh for the memorial service. Rabbi Jonathan Perlman declared, "What happened yesterday will not break us, it will not ruin us." Pittsburgh Mayor Bill Peduto called the attack "the darkest hour of our city's history," but said they are resilient. "We will work together as one. We will defeat hate with love. We will be a city of compassion, welcoming to all people no matter what your religion, or where your family came from on this earth, or your status," Peduto said. 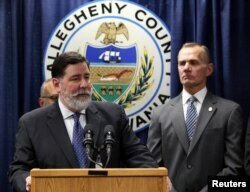 Pittsburgh Mayor Bill Peduto talks at a news conference the day after the Tree of Life synagogue shooting in Pittsburgh, Pennsylvania, Oct. 28, 2018. Rabbi Jeffrey Myers declared words of hate unwelcome in Pittsburgh and called on political leaders to set an example. "It starts with everyone in this room. And I want to address for a moment some of our political leaders who were here. Ladies and gentlemen, it has to start with you as our leaders," Myers said. Stop the words of hate. My mother always taught me: if you don't have anything nice to say, say nothing. If it comes from you, Americans will listen." The tributes and appeals to fight hate continued Monday. Flags on U.S. government buildings, including all U.S. embassies and military installations, flew at half-staff. The United Nations Security Council stood for a moment of silence. Documents outlining the charges against Bowers say he was armed with an AR-15 assault rifle and three handguns. He said that he wanted all Jews to die because he believed Jews "were committing genocide to his people." That apparently refers to his belief that a Jewish refugee agency is helping foreign nationals enter the U.S., putting non-Jews in danger. In a message he apparently posted online just minutes before the attack, Bowers said the Hebrew Immigrant Aid Society, "likes to bring invaders in that kill our people. I can't wait while my people are getting slaughtered ... I'm going in." People gather outside the Soldiers & Sailors Memorial Hall & Museum, Oct. 28, 2018, in Pittsburgh, during a community gathering in the aftermath of the deadly shooting at the Tree of Life Synagogue a day earlier. 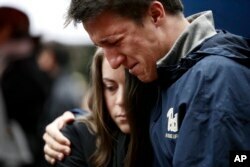 Officials said the victims included eight men and three women ranging in age from 54 to 97 years old. Six people were wounded, including four police officers. The website was shut down Monday when its financial backers pulled out.